Grameenphone 6GB Internet @Tk199 (GP New Internet Offer)! Bangladesh best mobile phone SIM operator company is Grameenphone (GP), recently run a very satisfaction internet offer 6GB internet data only 199Tk. GP Ramadan internet offer 2018, GP new internet package at the lowest price, GP particular data offer 2018, GP MB provides 2018. The first time GP provide big data offer opportunity, 6GB Tk199 Internet Pack is perfect for those who use high user. Normal internet user may be not like this offer because of days 6GB at Tk199 internet Offer validity 7 days. 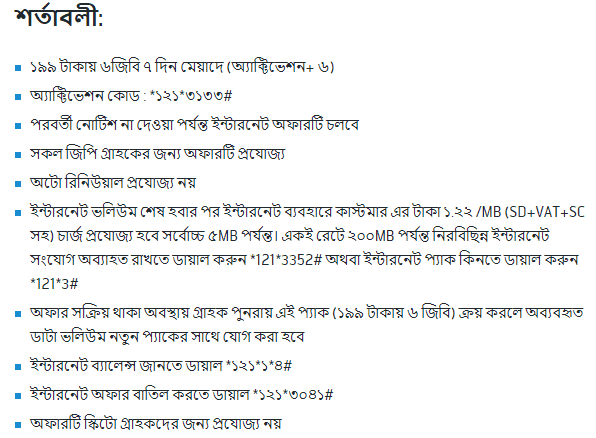 This offer eligible for all Grameenphone customers. To activate 6GB @Tk199 Activation code: *121*3133#. When the offer is activated, the remaining data volume will be added to the new pack when the customer purchases this pack again (6GB at 199 Tk). To cancel Internet offer Dial *121*3041#. The offer is not applicable for Skito subscribers. After the Internet volume is over, the customer’s usage of Internet Tk1.22 / MB (including SD + VAT + SC) will apply up to 5MB. All the terms of internet packs will be applicable here. A customer can be purchased many times 6GB at Tk199 internet offer data package.